This recipe is from the P90X2 Nutrition Guide and it’s BAnGIN!!! My husband loves it, my kids love it & I love it!! And guess what? It’s Vegan too! Make it and let me know how it is!! 2. Place first 5 ingredients into a bowl and drizzle with olive oil to coat, along with oregano and sea salt. Toss to make sure all vegetables are well coated. 3. Place vegetables on a baking sheet lined with parchment. Place in oven and roast for 10-15 minutes, or until browned. 4. Cook pasta according to package directions. Drain, rinse, and return to pot. 5. Add vegetable broth to pasta and place over very low heat. Add crumbled tempeh and stir to combine; cook just long enough to heat through. 6. 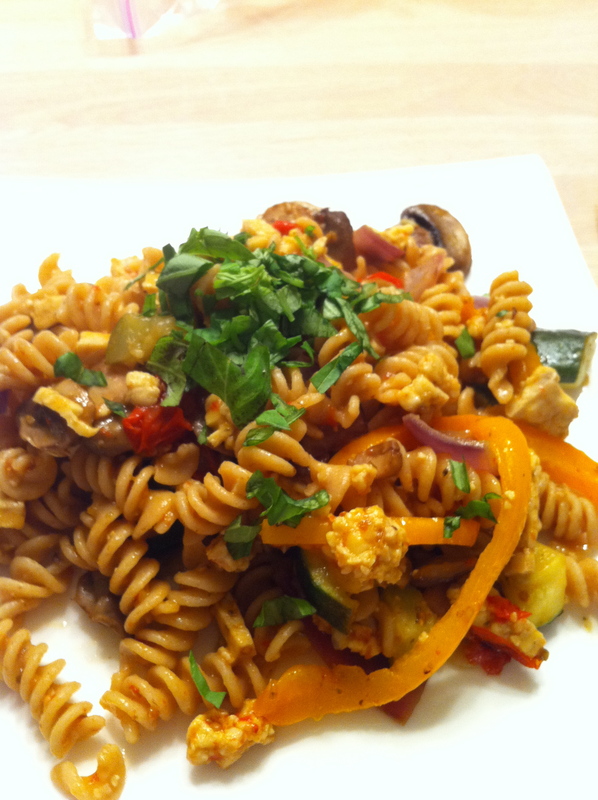 Add roasted vegetables to pasta mixture and toss to coat. 7. Add basil and season with sea salt & pepper. Serve immediately. WOW, my husband, children and I all love this recipe. It’s super easy to make, and my 2 year old had fun helping me put this together which is an added bonus! Try them out for yourself or just make the granola to add to yogurts and anything else really. Horton notes in the book that pre-made granolas that you find in the store are full of fat and added sugar and this one isn’t. In a large mixing bowl, combine the oil, syrup or agave nectar, and extract. Whisk together until well combined. Pour the oil mixture over the oats mixture and stir to combine. Spread the granola evenly on the baking sheet. Bake for about 30 minutes, or until golden brown. Remove it from the oven and let it sit for 5 minutes to crisp up, and then break it into chucks. Use a fork to mash up the banana, then mix it with the granola and almond butter. Roll the mixture into a bar. Freeze. When you’re ready to eat, heat the sticky bar in the microwave on high for 20 seconds. You can double up or triple this recipe. Place dried mushrooms in medium pot with 6 cups water. Bring to a boil, then reduce heat and simmer 15 minutes. Remove from heat and set aside to cool slightly. When mushrooms are soft, remove from broth and cut off and discard stems. Dice caps and place back in with broth. In large pot over medium heat, sauté onion, garlic and ginger in oil 3 minutes. Add carrots and sauté 3 minutes. Add kale or collard greens, beans and mirin, and sauté until greens are deep green and tender. Pour broth and mushrooms into pot with kale, add tamari and vinegar and simmer 5-7 minutes. Season to taste with toasted oil and black pepper and serve. It’s wonderful the next day also. Some other suggestions are if you want a heavier meal to serve this over brown rice or soba noodles. Ok, so I made this twice in the past 2 weeks and my family LOVES this!! The recipe is from Wegmans and we used all ingredients from them. Roasted brussels spouts were a perfect side. Enjoy!! Spray baking sheet with nonstick spray. Place salmon on pan; season with salt and pepper. Combine basting oil, horseradish, and panko in a small bowl. Spread 1 tsp horseradish mustard on each salmon portion; top with 1/4 of horseradish-panko mixture. Bake about 14 min, until internal temp reaches 130 degrees. Check by inserting thermometer halfway into thickest part of salmon. Remove from oven; let rest 2 min.